While Ubisoft is busy teasing players via Facebook, we've got anonymous tipsters sending us images of the placeholder art for something called Assassin's Creed: Brotherhood. Ubisoft now confirms that this is indeed the next Assassin's Creed title. Between this alleged placeholder art and a recent website registration for AssassinsCreedBrotherhood.com, we're pretty sure we've nailed down the name for the next game in the Assassin's Creed series. 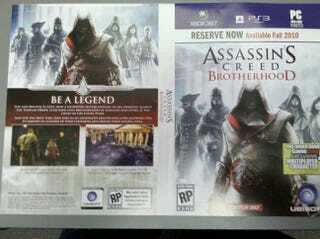 The box art features our friend Ezio, surrounded by a group of unknown asaassins, presumably representing the brotherhood that appears in the title, as well as the blurb on the back cover. "Live and breathe as Ezio, now a legendary master assassin, in his struggle against the Templar order. Lead your own brotherhood of Assassins and strike at the heart of the enemy. Rome. "And for the first time, take part in an innovative multiplayer layer allowing you to embody an assassin of your choosing and define their killing style. "A never-before-seen online multiplayer experience. "Lead your own brotherhood of assassins, as Ezio, and conquer Rome." The art also features a sticker for a preorder exclusive multiplayer character, available only through GameStop. Who wants to bet its Altair? The information on the box jibes with what we've heard so far about the next Assassin's Creed game, and the name certainly fits. Looks like it's coming to the PlayStation 3, Xbox 360, and PC. Hopefully that last one will do a better job with DRM than Assassin's Creed II did. Of course, without official confirmation by Ubisoft, this is still filed under rumor, but it's a damn good one. We've contacted Ubisoft for comment, and will update this post should they respond. Update: An Ubisoft representative has responded, confirming the image as real. "Ubisoft confirms the authenticity of this image and will provide more information next week." You heard the rep, more details on Assassin's Creed Brotherhood next week. Stay tuned!